If you’d like to see what a difference granite bathroom or kitchen countertops can make in your Columbus home, contact us at The Granite Guy. Are you wondering how you can make the bathroom or kitchen countertops in your home go from boring to something really amazing? If so, choose granite! Below are just 4 benefits that granite bathroom and kitchen countertops offer. They are Beautiful: You’re going to have great difficulty finding another material to make your home look more sophisticated and elegant. Because there are literally thousands of colors to choose from, plus the fact that no two granite slabs are identical, your bathroom or kitchen will be unique. They are Affordable: Yes, you read this right! 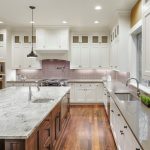 Most people incorrectly think that granite countertops are way outside of their budgets, but the reality is that today they are more affordable than ever. Over the years, the popularity of granite countertops has risen dramatically and, as such, prices have come down significantly. They are no longer exclusive to the rich and famous! Moreover, you can expect an excellent return on your investment – adding as much as 10 percent to the value of your home. They are Durable: Granite is one of the most durable and strongest materials for bathroom and kitchen countertops. Your new countertop will be scratch-resistant and heat-resistant, and its shine and beauty will last for many years. They are Easy to Clean and Hygienic: But isn’t granite a naturally porous material? Well, yes it is, but when granite bathroom or kitchen countertops are properly installed and sealed, they are virtually impermeable to bacteria and other germs. To keep them clean, healthy and shiny, just wipe with soapy, warm water after every use. 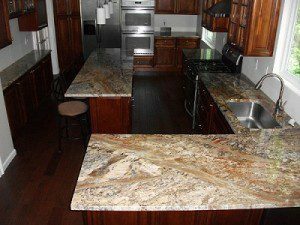 If you’d like to see what a difference granite bathroom or kitchen countertops can make in your Columbus, Ohio home, contact us at The Granite Guy.